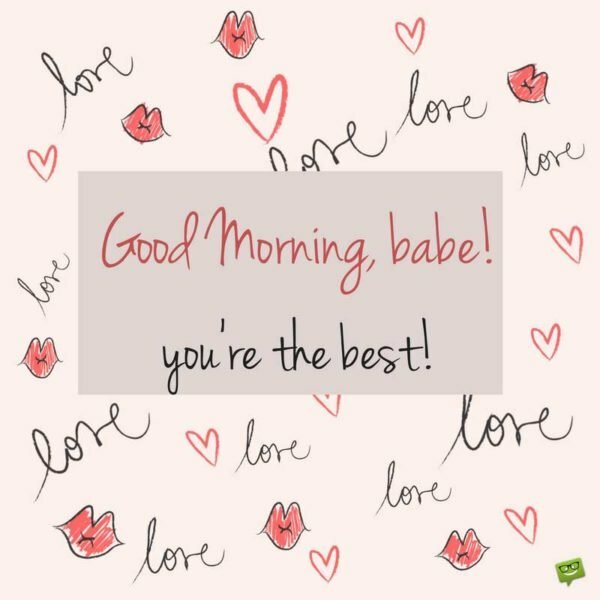 One of the best ways to start your husband’s day right is by sending him heartwarming good morning messages. However, coming up with sweet messages can sometimes be quite difficult to achieve. 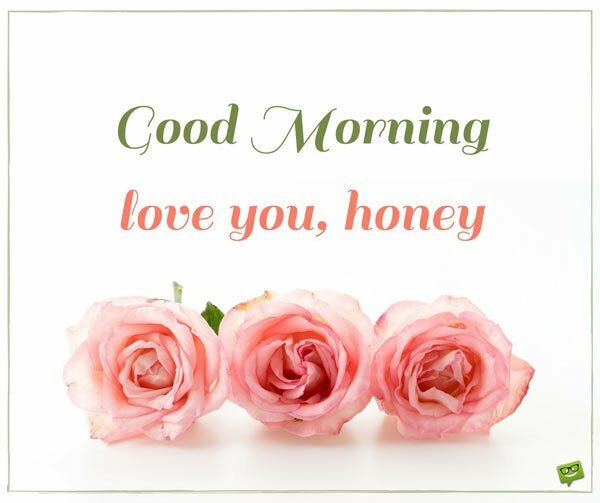 It is for this reason our team compiled the fine list of texts below to help you easily come up with excellent and memorable messages to start your beloved husband’s day with sunshine. Go through these messages below and choose your favorite(s). You can either send the text(s) the way they are or you can customize them by adding some of your own words to them. But whether you send them in their original version or add some modifications to them, your hubby is certainly going to like them. You are not only the reason for my happiness, but also the reason my world is never devoid of happiness and sunshine. 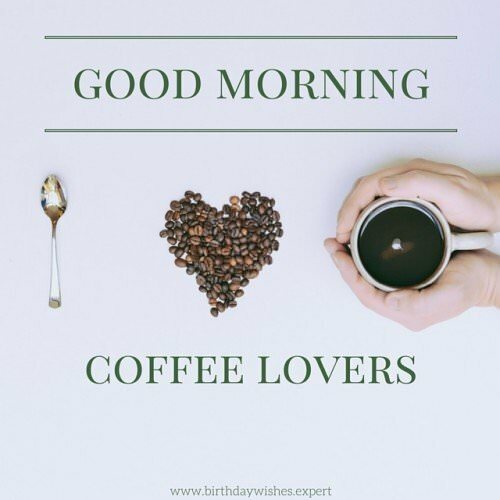 Good morning, my sweetheart. I feel like the most blessed woman on earth to have an angel like you in my life. Good morning, my love. Whenever I open my eyes in the morning, the first thing that I do is give thanks to nature for gifting me with such a wonderful and sweet husband like you. Good morning, babe. My love, whenever I see you smile at me, I am transported from this planet to the planet of sunshine and happiness. Good morning. I stopped asking God for blessings the moment He blessed me with all I need in this world – you, my dearest husband. Good morning. I don’t need anything else in this world if I can spend each day of the rest of my life waking up beside you. Good morning. The most special moment for my heart is when it finds itself next to yours. Good morning, my sweet husband. Having such a phenomenal husband like you in my life is the best example of God’s infinite love for me. Babe, thank you for touching my soul with your presence. 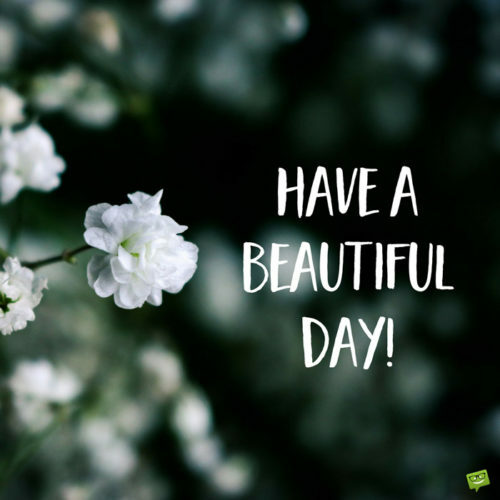 I hope you have a beautiful day. Good morning. 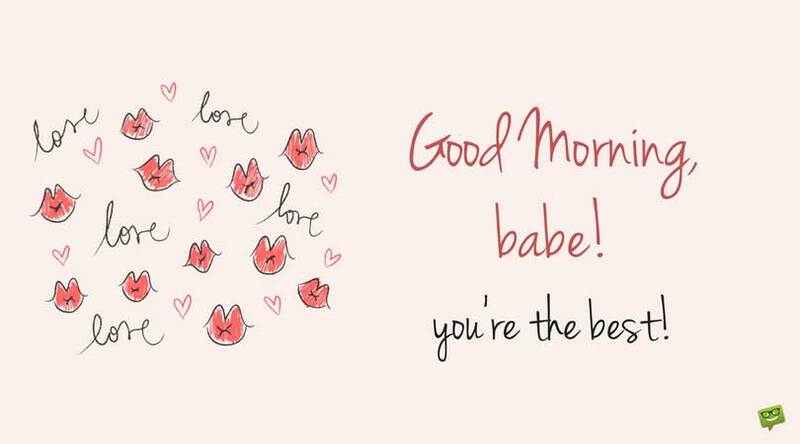 Wishing a beautiful morning to the most wonderful husband in the world. Thank you for making me feel like the most beautiful woman ever created by God. Babe, this morning, I just want to assure you for the millionth time that my love for you shall last until the end of time. Have a beautiful day. Every moment that I spend with you by my side is golden. Good morning, my love. You are the only sunshine that I wake up to every morning. I hope your day today is as beautiful as your love is to me. Good morning, babe. You’re the best. Babe, you are the only man in the entire world whose touch has the power to sweep me off my feet. Good morning. Whenever my lips and yours meet, I am instantly transported to a place comparable to heaven. I love you so much, my darling. Good morning. You are cool as cool can ever be, my dearest husband. Being in the arms of an angel like you is worth more to me than the combine wealth of all the nations of the world. Good morning. When I have you beside me, I can survive without air, water and food. Thank you for filling my soul with rainbow. Good morning. Wrapping me in your arms and planting kisses on my lips are all I need in this life. Good morning, sugar. Every time we kiss, I hear our souls whisper the words “I love you” to each other. Good morning. Every single kiss these lips of mine receive from yours is more precious than diamond. Good morning. Good morning. Love you, honey. Life becomes more meaningful to me when I’m in your arms. And when I kiss your lips, nothing has the power to stop me from going to paradise. Good morning. Not even the sun has the power to give me the warmth that your touch and kiss give me. Good morning, honey. Your love for me is the most beautiful thing in this entire universe. Good morning. My colorless life became as colorful as the sun and the rainbow when I kissed your lips for the first time. Good morning. Nothing in this world has the ability to caress my soul like your warm embraces and kisses. I vow to cherish and love you all the days of my existence in this world. Good morning. Waking up to the sight of my hero every blessed morning is enough to bring me all the happiness and fortune in the world. Good morning, my sweet husband and hero. My heart overflows with immense joy whenever I wake up next to you. You are all I need in this universe. Good morning. You make me feel happier than an illegal immigrant who has finally laid his hands on the Green Card he had been pursuing all his life. Good morning, sweetheart. You look so irresistible today, babe. All I want to do is kiss you until my lips get sour. Good morning. Good morning to only man in the world who loves me more without my makeup on. Babe, if our money grew wildly like our love, I have no doubt in my mind that we would easily dethrone the world’s richest man from his spot on the list of the wealthiest men in the world. Good morning. I don’t care whether I go to Heaven or not so far as I have you in my life. Good morning. I used to love chocolate more than anything in this world, but then you came into my life and everything changed. Good morning. Whenever we are apart from each other, I suffer from vitamin YOU. I hope you also suffer from vitamin ME when we are apart. Good morning. Babe, don’t forget that as my hubby, it is your job to make me happy whereas mine is to allow you make me happy. Good morning. Keep on moving and believing. Don’t ever stop. Remember that before good things happen in your life, you would have to go through some pretty trying moments. This is just one of them. Good morning. I know things haven’t been the best, but if you remain optimistic and strong, you shall conquer all the adversities that stand in your way. Good morning, honey. Don’t allow the current tough situations you are going through put negativity into your life. Just remember gold is never gold until it is purified. Good morning. Things might have not worked out the way you imagined they would, but don’t despair because we have each other, and that’s all that matters in this world. Good morning. Everything would eventually turn out the way you want them to. Just hang in there and put your trust in God. Good morning, sweetheart. Among all the choices you have during these tough times, the best is to stay positive. With positivity by your side, life’s challenges are easily surmounted. I hope your day is as beautiful as you are to me. Everything is going to be alright, babe. Sometimes when things appear to be falling apart, what they are really doing is falling into place. 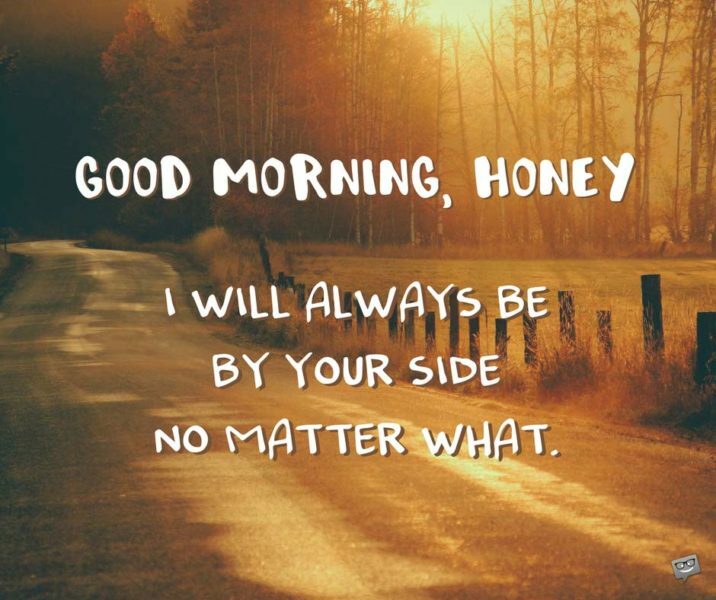 Good morning, my beloved husband. Babe, remember that it is just a bad day and never a bad life. Good morning. Good morning, honey. I will always be by your side no matter what.